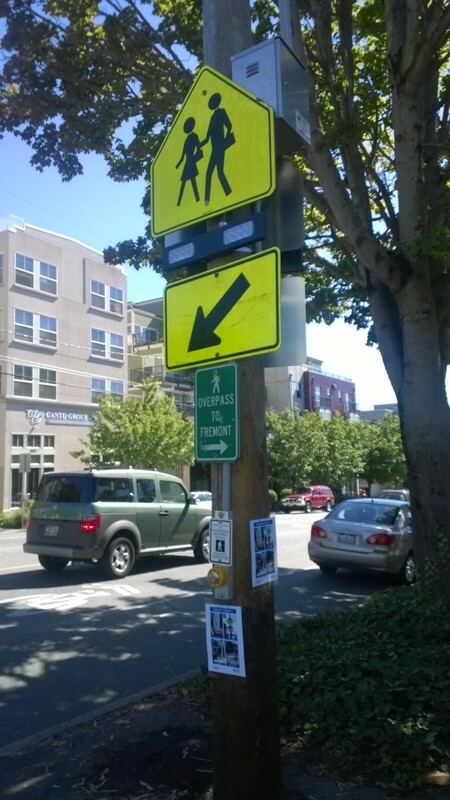 New pedestrian-activated light at Stone Way and N 41st. Taking the pictures, photographer counted FIVE cars ignoring ped light, several even after one stopped in opposite lane. With Friday’s accident at N 40th and Wallingford Avenue, resulting in injury to a 12-year-old on his way to Hamilton Middle School, parents in Wallingford and Fremont are once again deeply concerned about the safety of pedestrians in the Hamilton/ BF Day neighborhood. FNC has been working to increase pedestrian safety between the pedestrian bridge over Aurora at N 41st and Hamilton, and a new pedestrian-activated light was just installed with more safety features yet to come–see photo at right. Still, drivers often ignore the light, and it is imperative that pedestrians make sure cars are stopping and they are seen before stepping out into the street. Update at 11:58 a.m.: The 12-year-old boy injured when he was hit by a car Friday morning is expected to be released from Harborview Medical Center soon, according to Seattle Public Schools. The district said the boy is a seventh-grader at Hamilton Middle School; some media outlets had reported he is a sixth-grader. Update 10:04 a.m.: Seattle police now say that a boy struck by a car in Wallingford Friday morning is 12. According to police, the boy was walking north on Wallingford Avenue North with a group of older kids when a driver heading east struck him while he was in a crosswalk at North 40th Street. The boy rolled onto the hood of the car and struck his head on the windshield. Police said the driver stopped the car. The department’s traffic collision unit and a drug-recognition expert are investigating. Police said sunlight shining into the driver’s windshield may have contributed to the accident. Seattle police spokesman Patrick Michaud said the boy suffered a cut to the head and was taken to Harborview Medical Center. Police say Seattle Public Schools is making counselors available to students at the boy’s school. Original post: A 10-year-old boy was hospitalized Friday morning after police say he was struck by a car in Wallingford. Department spokesman Patrick Michaud said the boy was crossing the street at North 40th Street and Wallingford Avenue North around 7:30 a.m. He was in the crosswalk when the car that struck him apparently ran a red light, Michaud said. The boy suffered a cut to the head and was taken to Harborview Medical Center. Police are investigating. A) Just keep going and hope for the best? B) Look in your rear view mirror to see if anyone else is stopping? C) Close your eyes and speed up? D) Slow down and stop until you can see where you are driving?